It's true that the Kardashian empire is crumbling slowly but surely and now they’ve gone from heroes to near zeroes. In less than two years, Keeping Up With The Kardashians stars Kim Kardashian and Kris Jenner‘s “likability” have both plummeted more than 50 percent, according to the Q Scores, a closely watched measure of recognition and popularity that marketers use to evaluate celebrities’ appeal. Mother-of-one Kim’s attraction to the general public has plunged from a 9 score in 2011 — right after she married ex-husband Kris Humphries — to a disappointing 4 in September, the latest poll results of women over the age of 18 — obtained exclusively by RadarOnline.com — reveal. 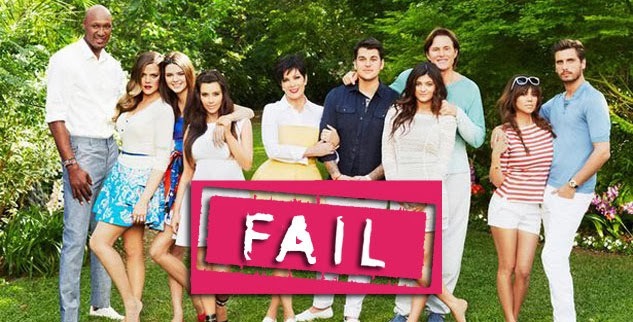 Momager Kris, who last week announced her split from husband Bruce Jenner after 22 years, was a 12 in 2011. Today, she is a lowly 4, despite having her own talk show on FOX! and quickie divorce from NBA star Kris Humphries and subsequent relationship with Kanye West. “Kim Kardashian and her mother, Kris Jenner, also have higher than usual negative reaction from people,” said Henry Schafer, executive vice president of Q Scores. “In other words, people love to hate them, but they still tune in to their television shows and follow the Kardashian’s in the media. A typical score for someone of Kim’s stature, Schafer argued, would be over 10. comparison, Project Runway star Tim Gunn has a Q score of 15 and is considered extremely popular among women, he added. The damaging news is the latest blow to the beleaguered family, who are also suffering when it comes to their television ratings: A recent episode of E!’s Keeping Up With The Kardashian‘s garnered the third lowest ratings in the franchise’s history, as Radar revealed. The one-time smash hit gathered a mere 1.79 million viewers overall and only one million viewers between the ages of 18 and 49, which is said to be the most important demo in television, compared to the Season 8 premiere that boasted 3.02 million overall viewers. That coincided with sibling Khloe‘s husband Lamar Odom being caught in the middle of affair allegations with numerous women, which was quickly followed by the news that the ex-Los Angeles Clippers forward has been struggling with drug abuse – namely the prescription drugs Oxycontin and Ambien, as well as illicit drugs like cocaine and crack. Despite the doom and gloom, however, there is one member of the Kardashian clan that America loves, Schafer said… and it’s Khloe. “Khloe has always been extremely popular and she individually doesn’t have a higher negative reaction from people,” he said. Khloe’s Q score was 11 in 2011, 8 in 2012 and 11 in 2013, the results confirmed.